This practice requires the student to have permission/empowerment received from a qualified master in order to engage in the self-generation of the deity. However, it is permitted to do this practice without such an empowerment as long as you do not generate yourself as the deity. 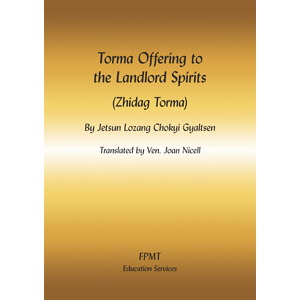 The Torma Offering to the Landlord Spirits (Zigdag Torma) is a common ritual, often done in the context of other more extensive practices such as self-generation sadhanas, burning offerings, land consecrations, and Dharma protector pujas. 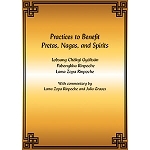 The torma offering placates the many spirits who live and own the land around us and beyond, requesting them to create favorable conditions for our practice and activities. Although the practice may be recited by anyone, a tantric initiation into any of the four classes of tantra is required to do the practice in full as the offering can only be blessed on the basis of having self-generated as a deity.